Cheese enchiladas are a Tex-Mex mainstay. 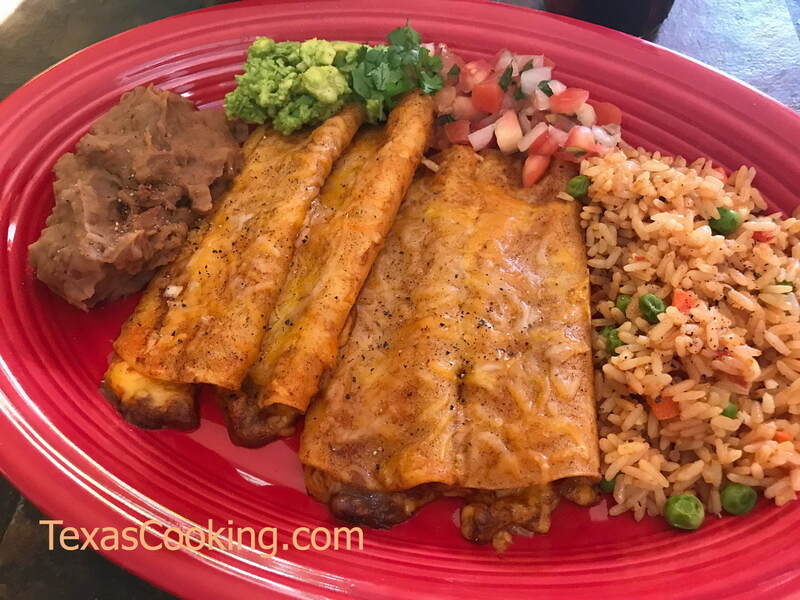 A plate of enchiladas, refried beans and Mexican Red Rice is one of the meals that expatriate Texans long for. And although Mexican restaurants are found nationwide these days, take it from a Texan, it's not the same. For the Chili Gravy, make a light roux by melting the shortening or lard in a skillet and stirring in the masa harina. Stir and cook a few minutes until the masa harina has browned a little. Add the chili powder, water and salt, and continue to stir and cook until mixture has thickened. Set aside and keep warm. For the Enchiladas, lightly grease a 9x13-inch Pyrex dish, and preheat your oven to 400°F degrees. Chop the onions, grate the cheese, and set aside. Heat the oil in a second skillet on medium heat. (It's ready when you see the oil "shimmer".) Have the corn tortillas ready. Putting the enchiladas together is just a series of steps. And if you're the kind of cook that freaks out when the kitchen gets a little messy, you might want to consider finding a good Tex-Mex restaurant instead. Pick up a tortilla with tongs and dip it into the hot oil for two or three seconds. This first step is to soften the tortilla. Remove the tortilla from the oil, letting the excess oil drip back into the skillet. Dip the tortilla into the chili gravy, coating both sides. Place the now-coated tortilla in the 9x13-inch pan, put a handful of grated cheese and onion on the tortilla, fill from end to end so that it is plump, and roll it up. Place the rolled tortilla seam-side-down in one end of the pan. Repeat ths process with the remaining 11 tortillas. The pan should be full. Pour the remaining Chili Gravy on top of the enchiladas. Sprinkle the enchiladas generously with more cheese. Bake for about 10 minutes until the cheese is bubbly. Serve at once. Makes four servings of three enchiladas each. A word about chili powder: The most-recommended chili powder in Texas is Gebhardt's, and for good reason. Lately, I have started trying chili powders for sale in the bulk sections of the major H-E-B and Central Market grocery stores with great results. For the enchiladas in the recipe photograph, I used their "San Antonio"chili powder, which is darker in color and has a taste of cumin. Of course, you can always get your hands on some dried chiles pasillas and make your own chili powder. Behold the extraordinary powder for Tex-Mex enchiladas! Other enchilada sauces to pour over cheese enchiladas are Chile con Carne Sauce, Tomatillo Sauce, Ranchero Sauce and Chipotle Sauce. See, also, our slighty more complex, but incredibly good, recipe for chili gravy. Not so quick, but in a class by itself. And remember this: Buy a product called "chili powder" -- not cayenne, not crushed red pepper, not ground red pepper.